This is only my second Rosebank. I thought the first I tried was very pleasant but not very much more. This one is also from an ex-bourbon cask, and was also distilled in 1990. Will this one have more to recommend it than the other did? Let’s get right to it. Nose: Bright, lemony, slightly grassy. Below that is a nice malty sweetness. With time the lemon comes to the fore and intensifies quite a bit (as in it gets to be a concentrated lemon flavour) and a little later it gets somewhat preserved/musky. Just a hint of peppery wood spice too. Not a whole lot of change on the nose with a few drops of water. Palate: Very much as advertised by the nose, except with the malt leading. The lemon is actually quite a lot more laid-back on the palate than on the nose, and there’s more sweetness here too, and a just a touch of white pepper. Very nice mouthfeel and very drinkable at full strength. With water the lemon gets more pronounced on the palate. After a few minutes all the major flavours–lemon, malt, barley sugar–get very nicely integrated with a little tingly wood spice on the side. Very nice. Finish: Medium. No interesting development. Comments: This is very nice but, again, nothing overwhelming. If this is quintessential Rosebank then I think I will be able to cope with the distillery’s demise. Glenlivet’s Nadurra and a host of other bourbon cask Speysiders provide very similar pleasures. And once again, if this was triple-distilled it’s hard for me to tell the difference between this and the more common double-distilled Speysiders of similar profile. Thanks to bpbleus for the sample! 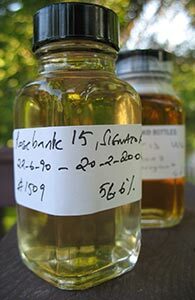 This entry was posted in -Whisky by Rating, 85-89 points, Rosebank, Signatory, Whisky by Bottler. Bookmark the permalink.